DIRECTIONS: This cemetery is located on County Route 7, .3 miles south of the intersection with Route 11. This cemetery transcription was begun 20 July 1995 and completed 22 August 1995 by Joyce M. Ranieri. It was updated and photographed on 17 September 2000. The oldest burial appears to be that of Patrick DUNN who died March 9, 1854 at age 5 yrs. 1 mo. John Died February 3, 1885 Æ. 85 yrs. Catherine His Wife Died November 12, 1891 Æ. 88 yrs. Willie T. Died October 16, 1884 age 2 yrs. Ettie Died May 10, 1886 Age 7 mos. David Died December 17, 1918 Age 70 yrs. wife of H. C. BOMBARD Died Sept. 15, 1910 Æ 32 yrs. 10 mos. Florence LaFLEUR 1898 - 1978 Mother "We Love You"
"May they rest in peace." "Abide in Me and I in You." July 5, 1956 - June 15, 1984.
wife of H. C. BOMBARD Died Sept. 29, 1899 Æ 28 yrs. Lusina 1861 - 1918 "At Rest"
In memory of a wonderful mother. "Now a place in heaven." "O Lord Hear My Prayer"
John Died November 13, 1881 Age 54 yrs. Margaret His Wife Died February 16, 1908 Age 82 yrs. Mary Their Daughter Died November 13, 1903 Age 50 yrs. John Their Son Died December 2, 1911 Age 41 yrs. Margaret OCONNER, wife of Michael BURKETT Died Oct. 27, 1894 Age 52 yrs. 2 mos. "May her soul rest in peace Amen." "I have finished the work which thou hast given me to do." Elvira A. BOMBARD wife of George CAMPBELL Died April 28, 1907 Age 33 yrs. 8 mos. "May his soul rest in peace Amen." Leslie son of J. & M. CAMPBELL Died Sept. 3, 1901 In his 18th Yr.
Raulin T. Died January 8, 1901 Age 2 yrs. 11 mos. "I have finished the work which thy hath given me to do." Close to the Sacred Heart. Mary Wife of William COONEY Died August 30, 1880 Age 46 yrs. To those she loved and left." Catharine wife of James COX Died Jan. 25, 1899 Age 74 yrs. James Died Feb. 22, 1907 Age 83 yrs. Co. E 97th Reg. N.Y. Vol. MAY 18, 1922 - JUN 24, 1999. Julia A. wife of Daniel CUSHING Died March 26, 1868 Age 24 yrs. May their souls rest in peace Amen. Katie E. Daughter of C. J. & C. DALY Died Sept. 28, 1888 Age 30 yrs. Inscription on the bottom is illegible. C. J. DALY Born July 13, 1829 Died May 14, 1910 Co. G. 51 Mass. Vol. "In loving memory of my husband"
Sarah wife of John DEEGAN Died Jan. 22, 1898 Age 82 yrs. Isdore Died January 11, 1892 Age 63 yrs. Francis J. DEVLIN CO. M. U.S. ART. Julia His Wife Died Feb. 16, 1896 Age 82 yrs. Sylvester Died Mar 6, 1898 age 4 yrs. 6 mos. "May her soul rest in peace." Edward Died June 7, 1899 Age 53 yrs. Matilda His wife Died March 25, 1926 Age 75 yrs. Jamie M. Died Oct. 1, 1888 Age 20 yrs. 8 mos. Eddie A. Died Sept. 11, 1882 Age 1 yrs. 3 mos. Eliza wife of Francis DEYETTE Died April 20, 1892 Age 66 yrs. "May her soul rest in peace. Amen." Ellen daughter of E. & M. DONIHEE, Died Jan. 28, 1890 Age 5 mos. 5 days. James Died June 4, 1895 Age 50 yrs. 6 mos. "Mother of Christ Pray for Us"
Nelson Died May 30, 1887 Age 43 yrs. Joan Ann 1939 - 1940 "Of such are the Kingdom of Heaven." "Father, not my will but thine be done." "May her soul rest in peace Amen." John Died Sept 16, 1894 Age 77 yrs. Mary, His Wife Died July 23, 1875 Age 54 yrs. Patrick Died March 9, 1854 Age 5 yrs. 1 mo. John Died May 14, 1858 Age 2 hrs. Elenor DUNN Died March 7, 1883 Age 67 yrs. Mary E. Died April 16, 1899 Age 17 yrs. Mary His Wife Died April 15, 1898 Age 47 yrs. Agnes E. February 19, 1930 - July 27, 1985 "Beloved Mother"
Catharine Wife of Michael ENRIGHT Died January 10, 1869 Age 68 yrs. "May her soul rest in peace Amen." John Died September 29, 1918 Age 84 yrs. Mary HARTY His Wife Died February 27, 1911 Age 77 yrs. Mary His Wife Died February 27, 1911 Age 77 yrs. Michael Died February 24, 1888 Age 26 yrs. Margaret Died December 27, 1888 Age 19 yrs. Kate Died January 31, 1882 Age 23 yrs. "May their souls rest in peace Amen." Michael Died February 16, 1854 Aged 53 yrs. "May his soul rest in peace Amen." Walter T. Son of Robt. & Emma FARMER Died July 25, 1898 age 21 yrs. 8 mos. Abraham O. Died July 9, 1891 Age 46 yrs. James Died Jan. 30, 1890 Age 60 yrs. 8 mos. William Died July 18, 1887 Age 42 yrs. "May his soul rest in peace Amen." John Died Dec. 26, 1889 Age 86 yrs. Mary His Wife Died Nov. 1, 1890 Age 74 yrs. Frank F. Son of Isaac M. & Clara FULLER Died December 4, 1899 Age 27 yrs. 2 mos. 23 days. "May his soul rest in peace Amen." Jeremiah Died May 18, 1900 Age 65 yrs. Charity M. LANTRY His Wife Died March 16, 1924, Age 88 yrs. Leon 1945 - 1946 "Our Beloved Junior"
Bernard Died Feb. 2, 1897 Age 83 yrs. Bridget His Wife Died Feb. 1, 1897 Age 78 yrs. Bernard their son Died March 6, 1873 Age 24 yrs. Michael their son Died Feb. 4, 1897 Age 50 yrs. Bridget His Wife Died March 22, 1878 Age 21 yrs. Me and you, you and me, thats the way it will always be. Louis Died June 29, 1909 Age 67 Yrs. Co. K 11 Regt. VT Heavy Art. Virginia MARTIN, His Wife Died July 26, 1910 Age 60 yrs. Isaac Died February 1, 1901 Age 62 yrs. Co. I 16th Reg. NY Vol. Dan Died June 7, 1933 Age 86 yrs. Jula LaPRAD His Wife Died October 10, 1920 Age 72 yrs. By and by I will awake with an immortal bloom. "We Love You -Your Children"
Nancy Wife of Thomas HINNIGAN Died October 15, 1892 Age 65 yrs. "May her soul rest in peace Amen." 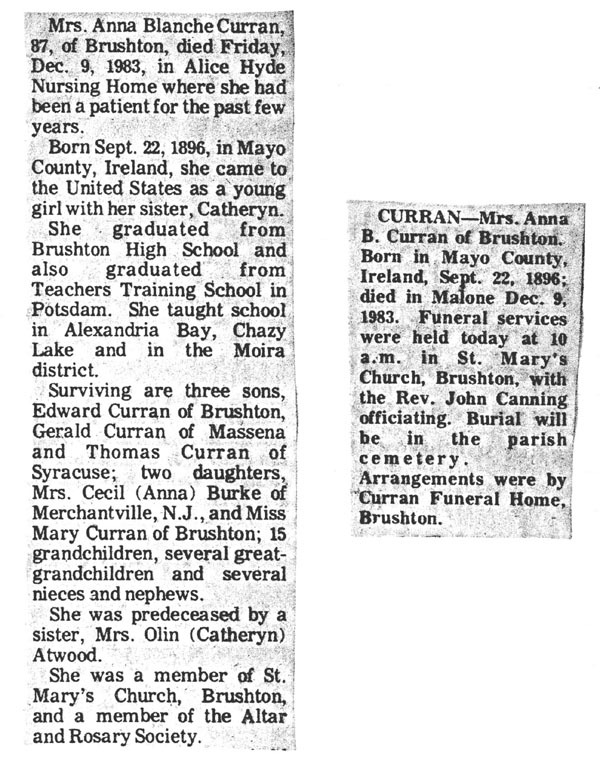 Michael, Mother, Father, James interred in Brasher Falls, Katherine, Mary A., John A., Katherine A. "In Loving Memory of Tiffany"
Evelyn M. HUGHTO June 20, 1916 - October 25, 1918 "Our Little Angel"
Julie His Wife 1840 - 1927. Andrew Died April 21, 1897 Age 74 yrs. Mary His Wife Died June 24, 1893 Age 72 yrs. Lloyd E. Jr. 4 yrs. Mable M. Daughter of C. L. & C. C. JOCK Died March 12, 1910 Age 4 yrs. "Abide in me and I in you"
Died March 26, 1916 Age 54 yrs. John Died March 7, 1908 Age 84 yrs. Katherine GALLIVAN His Wife Died Sept. 6, 1895 Age 65 yrs. Daniel KING Died Feb. 29, 1888 Æ 75 yrs. "Gone but not forgotten." Patrick Died Oct. 8, 1887 Age 73 yrs. Katherine Daughter of P. & M. KIRBY Died July 27, 1873 Age 22 yrs. Susie Wife of Joseph LaBELL Died January 7, 1907 Aged 39 yrs. PVT CO B 193 NY VOL INF. Agustus Died May 27, 1900 age 74 yrs. Alvin Died November 6, 1909 Age 74 yrs. Co. H 98 Reg. N.Y.V. Barney Died June 26, 1894 Age 62 yrs. Louisa His Wife Died February 4, 1912 Age 76 yrs. "Rest in peace Amen. Our loved ones at rest." PFC 11 Field Arty 6 Div. Lizzie A. SAVAGE Wife of Thomas LaROCK Died November 19, 1901 Age 83 yrs. "May her soul rest in peace Amen." "In Memory of our Brother"
Ivan H. Son of G. M. & J. L. LAUBER Died December 9, 1918 Age 9 mos. Mathew Died February 16, 1917 Age 92 yrs. Co. H 98th Regt. NYS Vol. Michael Died September 30, 1885 Age 62 yrs. Katie A. Died January 6, 1884 Age 18 yrs. Alice Anna Died 11 October 1882 Age 14 yrs. John Died February 6, 1878 Age 8 yrs. Together we walk with our brother Ken. "Whither thou goest I will go." Patrick Reuben son of Patrick & Ella McCAFFREY Died Aug. 7, 1888 Age 11 mos. 17 days. Died Nov. 1, 1903 Age 21 yrs. 8 mos. Robert E. 1921 - 1983. Mother "May her soul rest in peace." Angeline McGEE Died July 8, 1921 Æ 76 yrs. Julia JESSMER Wife of Cyril McGEE Died July 24, 1896 Age 68 yrs. "May her soul rest in peace Amen." James Died April 6, 1898 Age 59 yrs. Charles McGOWAN Died June 8, 1878 Age 78 yrs. Catharine His Wife Died Aug. 16, 1880 Age 78 yrs. Charles their son Died Oct. 20, 1863 Age 22 yrs. Catherine Wife of Miles McCABE Died Sept. 22, 1865 Age 44 yrs. Margaret wife of Francis McGOWEN Died Oct. 5, 1875 Age 35 yrs. 9 mos. Mary His Mother Died September 15, 1899 Age 76 yrs. James A. Died May 15, 1889 Age 40 yrs. "In Memory of our Baby"
Mary Wife of William MOREHEAD Died July 5, 1893 Age 77 yrs. Wm. Died July 28, 1871 Age 48 yrs. 7 mos. "May his soul rest in peace Amen. Farewell dear wife and children." James MULHOLLAND Died March 30, 1877 Age 81 yrs. Bridget His Wife Died January 31, 1875 Age 69 yrs. Peter Died July 22, 1875 Age 30 yrs. Mary His Wife Died Oct. 29, 1875 Age 29 yrs. Mary wife of Thomas MULLEN Died July 4, 1895 Age 78 yrs. Thomas Died December 23, 1890 Age 78 yrs. Mabel 1898 - 1984 "In Gods Care"
REGINALD F. NEWTOWN Reginald F.
Rev. J. C. Born July 15, 1844 Died October 9, 1892 "Requiscat in Pace"
Mary OCONNELL Died July 12, 1897 Age 21 yrs. John OCONNOR Died Octocter 25, 1899 Age 70 "May his soul rest in peace. Amen." Ella May Daughter of Geo. & Mary ONEY Died January 5, 1892 Age 16 yrs. 8 mos. To greet us on the blissful shore." Peter N. Died April 26, 1904 Age 33 yrs. Amos Died September 8, 1913 Age 70 yrs. Co. G 142 Reg N.Y.V. Chas. Died March 29, 1916 Age 77 yrs. Co. E. - H 98th N.Y. Inf. Kit daughter of G. & E. PERRY Died January 31, 1891 Age 13 mos. Lynn Joseph 1967 - 1970 "Of such are the Kingdom of Heaven." Tony R. 1961 - 1980 "In memory of our son." Lizzie His Wife Died August 2, 1902 Age 36 yrs. 7 mos. Anna H. Died April 4, 1889 Age 2 yrs. 2 mos. Mary ARKINS His Wife 1838 - 1908 "Requiescant in pace." Peter Died April 12, 1926 Age 78 yrs. Catharine CAREY wife of Peter QUAIN Died Nov. 5, 1899 Age 54 yrs. Thomas Died Mar. 17, 1883 Age 75 yrs. Mary Ann DOUGHERTY, His Wife Died May 5, 1899 Age 84 yrs. Sarah, their daughter Died Aug. 9, 1874 Age 25 yrs. Thomas W. QUINN Died June 17, 1904 Age 42 yrs. Miles Died Dec. 24, 1881 Age 72 yrs. Margaret wife of Miles QUINN Died Dec. 3, 1899 Age 81 yrs. Thomas Died June 2, 1888 Age 90 yrs. Died December 1872, Age ? years and 8 mos. Douglas Mathew April 10, 1960 "Our Baby"
Emma LAMICA His Wife 1890 - 1958. "In Memory of Our Grandson"
David Died Dec. 24, 1899 Age 60 yrs. Celinda His Wife Died Jan. 20, 1877 Age 39 yrs. Emily wife of Julius Richards Died July 14, 1899 Age 30 yrs. Bridget wife of John RILEY, Died Jan. 16, 1901 Age 86 yrs. Where our sorrow is no more." Anna E. our daughter Died Aug. 22, 1910 age 45 yrs. James Died April 3, 1867 Age 47 yrs. Mary NOLEN Wife of J. RILEY Died March 26, 1889 Age 69 yrs. 7 mos. James Died Mar. 29, 1866 Age 23 yrs. 4 mos. John died April 17, 1882 Age 69 yrs. 9 mos. John Jr. Died Nov. 10, 1850 Age 60 yrs. Hannah their daughter, Died May 16, 1877 Age 30 yrs. May their souls rest in peace, Amen. Patrick Died May 11, 1867, Age 21 yrs. "Take Thy Cross and Follow Me." "Jesus, Mary, Joseph Pray for Us"
John F. May 11 1905 Age 25 yrs. Edward J. April 15, 1907 Age 30 yrs. Ellen F. Sept. 1, 1904 Age 14 yrs. 8 mos. Mary A. TYO His Wife Died December 3, 1908 Age 59 yrs. Ellen ROZON Died Dec. 12, 1886 Age 32 yrs. Mary L. ROZON Died Nov. 25, 1892 Age 23 yrs. M. Ruby ROZON Died Mar. 29, 1898 Age 22 yrs. Eva E. ROZON Died Feb. 5, 1883 Age 6 yrs. Betsey LeCLAIR Wife of Frank H. RUSSELL Died April 21, 1897 Age 42 yrs. 1 mo. PFC 180 INF 45 INF DIV. "For whosoever calleth on the name of the Lord shall be saved." John Sr. Died October 11, 1912 Age 88 yrs. Emily BRUNELL His Wife Died December 30, 1908 Age 83 yrs. Susan Lea 1966 - 1968 "Our Beloved Angel"
Emery 1845 - 1925 Co. G. 98 Reg. N. Y. Vol. John C. Died Sept. 10, 1890 Age 63 yrs. Rest in peace. John C. Died November 8, 1895 Age 32 yrs. 11 mos. Morris Died December 4, 1898 Age 77 yrs. Joseph M. Died June 25, 1909 Age 26 yrs. Julia wife of H. F. McELEROY Died April 27, 1894 Age 39 yrs. Mary wife of Patrick REARDON Died September 3, 1885 Age 83 yrs. P. H. Died June 8, 1904 Age 76 yrs. James E. Died June 19, 1904 Age 39 yrs. Morris J. Died July 8, 1902 Age 45 yrs. Walter W. Died Aug. 22, 1908 Age 29 yrs. Agnes SAVAGE Died Sept. 2, 1891 Age 15 yrs. 8 mos. Julia L. CROSIER Died June 30, 1893 Age 33 yrs. 9 mos. Herbert S. CROSIER Died Oct. 9, 1887 Age 8 mos. Herbert FAY Died Oct. 4, 1888 Age 4 Mos. "The Cross is my anchor." Thomas Died Nov. 18, 1892 Age 50 yrs. Father "Gone but not forgotten"
Died June 29, 1915 Age 7 yrs. & 3 mos. Son Donald E. 1918 - no date. Della PERRY His Wife 1907 - 1999. PFC 306 INF. 77 DIV. PFC CO. L 60 PIONEER INF. Rev. Daniel M. 1868 - 1933 "Thou Art A Priest Forever." "May their souls rest in peace." Bridget wife of Louis TREDO Died Aug. 8, 1894 Age 44 yrs. John E. Died Dec. 14, 1884 Age 4 yrs. 3 mos. Margaret Died May 2, 1892 Age 1 yr. 11 mos. Louis TREDO Died Nov. 24, 1915, Age 70 yrs. PFC CO. 1 254 INFANTRY REGT. PVT. MED. DET. 13th INF. Jennet wife of Peter TUPPER Died Feb. 12, 1892 Age 61 yrs. 8 mos. 18 days. He can all our sorrow heal." "Abide in me and I in you". Martin WALSH Died December 26, 1911 Age 81 yrs. Julia OCONNOR His Wife Died Oct. 27, 1898 Age 47 yrs. Anna Our Daughter Died Dec. 24, 1902 Age 17 yrs. Margaret KERBEY wife of John WALSH Died Aug. 20, 1901 Age 55 yrs. Maggie Died Sept. 21, 1887 Age 18 yrs. Willie T. Died May 27, 1877 Age 7 mos. Maggie Daughter of John & Maggie WALSH Died Sept. 21, 1887 Age 18 yrs. May her soul rest in peace Amen. Married January 24, 1976 "Our Love Lives On"
who has always looked for the best in others and given the best he had, whose life was an inpiration, whose memory a benediction. God gives us love, something to love he lends us. She was the daughter of Dewey & Agnes LaVALLEY and is buried in her grandfather's plot. His name is Moses Lavalley who appears in the above transcription.